Definition at line 44 of file CReaction.h. Definition at line 51 of file CReaction.cpp. References CKeyFactory::add(), CONSTRUCTOR_TRACE, CCopasiRootContainer::getKeyFactory(), CCopasiObject::getObjectType(), CCopasiRootContainer::getUndefinedFunction(), initObjects(), CAnnotation::mKey, and setFunction(). Definition at line 76 of file CReaction.cpp. References CKeyFactory::add(), CONSTRUCTOR_TRACE, CCopasiRootContainer::getKeyFactory(), CAnnotation::getMiriamAnnotation(), CCopasiObject::getObjectType(), initObjects(), CAnnotation::mKey, mpFunction, and CAnnotation::setMiriamAnnotation(). Definition at line 108 of file CReaction.cpp. References cleanup(), DESTRUCTOR_TRACE, CCopasiRootContainer::getKeyFactory(), CAnnotation::mKey, and CKeyFactory::remove(). Definition at line 240 of file CReaction.cpp. References CChemEq::addMetabolite(), mChemEq, and CChemEq::MODIFIER. Referenced by CModelAdd::addReactions(), CModel::convert2NonReversible(), SBMLImporter::createCReactionFromReaction(), CModelExpansion::duplicateReaction(), and CCopasiXMLParser::ModifierElement::start(). Add a parameter mapping for the indexed parameter. Definition at line 348 of file CReaction.cpp. References fatalError, getFunctionParameters(), mMetabKeyMap, mpFunction, and CFunctionParameter::VFLOAT64. Referenced by CModelAdd::addReactions(), CModelExpansion::createDiffusionReaction(), SBMLImporter::doMapping(), CModelExpansion::duplicateReaction(), loadOneRole(), and CReactionInterface::writeBackToReaction(). Add a parameter mapping for the named parameter. Definition at line 374 of file CReaction.cpp. References C_INVALID_INDEX, fatalError, getParameterIndex(), mMetabKeyMap, mpFunction, and CFunctionParameter::VFLOAT64. Definition at line 236 of file CReaction.cpp. References CChemEq::addMetabolite(), mChemEq, and CChemEq::PRODUCT. Referenced by CModelAdd::addReactions(), CModel::convert2NonReversible(), SBMLImporter::createCReactionFromReaction(), CModelExpansion::createDiffusionReaction(), CModelExpansion::duplicateReaction(), CCopasiXMLParser::ProductElement::start(), test000058::test_bug1025_1(), test000058::test_bug1025_6(), test000059::test_unique_id_10(), test000059::test_unique_id_13(), test000059::test_unique_id_15(), test000059::test_unique_id_16(), test000059::test_unique_id_4(), test000059::test_unique_id_7(), and test000059::test_unique_id_9(). Definition at line 232 of file CReaction.cpp. References CChemEq::addMetabolite(), mChemEq, and CChemEq::SUBSTRATE. Referenced by CModelAdd::addReactions(), CModel::convert2NonReversible(), SBMLImporter::createCReactionFromReaction(), CModelExpansion::createDiffusionReaction(), CModelExpansion::duplicateReaction(), and CCopasiXMLParser::SubstrateElement::start(). Definition at line 840 of file CReaction.cpp. References CFunction::calcValue(), CFunctionParameterMap::getPointers(), mFlux, mMap, mParticleFlux, mpFunction, mScalingFactor, and mUnitScalingFactor. Referenced by calculateFlux(), calculateParticleFlux(), compile(), and initObjects(). Definition at line 826 of file CReaction.cpp. Definition at line 847 of file CReaction.cpp. References C_FLOAT64, CFunction::calcValue(), CFunction::dependsOn(), CFunctionParameterMap::getPointers(), mMap, mpFunction, and mScalingFactor. 856 (store < resolution) ? resolution * (1.0 + derivationFactor) : store; //TODO: why assymmetric? Definition at line 832 of file CReaction.cpp. References calculate(), CCopasiRootContainer::getUndefinedFunction(), mParticleFlux, and mpFunction. Definition at line 135 of file CReaction.cpp. Clear the parameter mapping for the named parameter. Definition at line 407 of file CReaction.cpp. Referenced by CModelAdd::addReactions(), CModelExpansion::duplicateReaction(), loadOneRole(), and CReactionInterface::writeBackToReaction(). Clear the parameter mapping for the indexed parameter. Definition at line 423 of file CReaction.cpp. Compile the reaction, i.e., links the metabolites and parameters with the rate function. The connection of the reaction and the function parameter mapping to the actual metabolites is established (before compile() the chemical equation and the reaction only hold the names of the metabolites). Definition at line 583 of file CReaction.cpp. References CFunctionParameterMap::addCallParameter(), CCopasiObject::addDirectDependency(), CCopasiVector< T >::begin(), calculate(), CFunctionParameterMap::clearCallParameter(), CCopasiObject::clearDirectDependencies(), CCopasiObject::clearRefresh(), CCopasiVector< T >::end(), CFunctionParameterMap::getFunctionParameters(), getFunctionParameters(), CCopasiRootContainer::getKeyFactory(), CChemEq::getModifiers(), CCopasiObject::getObjectName(), CChemEq::getProducts(), CChemEq::getSubstrates(), CCopasiRootContainer::getUndefinedFunction(), CCopasiObject::getValueObject(), mChemEq, mFlux, mMap, mMetabKeyMap, mParticleFlux, mpFluxReference, mpFunction, mpParticleFluxReference, CFunctionParameterMap::pUnmappedObject, CFunctionParameterMap::setCallParameter(), CCopasiObject::setDirectDependencies(), CCopasiObject::setRefresh(), setScalingFactor(), CFunctionParameters::size(), and CFunctionParameter::VINT32. Referenced by CModel::convert2NonReversible(), and CReactionInterface::writeBackToReaction(). Escapes double quotes and backslashes in a string and puts strings with tabs and spaces in double quotes. Definition at line 1659 of file CReaction.cpp. Retrieve the call parameter given to the kinetic function. Definition at line 216 of file CReaction.cpp. Definition at line 223 of file CReaction.cpp. Referenced by CModelAdd::addReactions(), CModelAnalyzer::checkReaction(), CMathObject::compileFlux(), CMathObject::compilePropensity(), CModel::convert2NonReversible(), ReactionsWidget1::copy(), SBMLImporter::createCReactionFromReaction(), CSBMLExporter::createKineticLaw(), CSBMLExporter::createReaction(), CLayoutInitializer::createReactionGlyph(), SBMLImporter::doMapping(), CModelExpansion::duplicateReaction(), CODEExporter::exportKineticFunction(), SBMLImporter::findCorrespondingFunction(), CChemEqInterface::getChemEqString(), CEFMTask::getNetReactionData(), CEFMTask::getSpeciesChanges(), CModelParameter::getUnit(), CReactionInterface::initFromReaction(), CMathReaction::initialize(), CODEExporterC::KineticFunction2ODEmember(), CModelMerging::mergeMetabolites(), object2variable(), CModel::printParameterOverview(), CModelAdd::reactionInvolvesCompartment(), CModelExpansion::replaceInReaction(), CCopasiXML::saveModel(), CChemEqInterface::setChemEqFromString(), SBMLImporter::setCorrectUsage(), CLLayoutRenderer::setDeduceSpeciesReferenceRoles(), CLLayoutRenderer::update_associations(), CReactionInterface::writeBackToReaction(), and CMMLOutput::writeRHS(). Definition at line 226 of file CReaction.cpp. Definition at line 116 of file CReaction.cpp. References CModel::getFrequencyUnitsDisplayString(), CCopasiObject::getObjectAncestor(), CCopasiObject::getObjectName(), and CModel::getQuantityRateUnitsDisplayString(). Retrieves the number of compartments the reaction is acting in. Definition at line 873 of file CReaction.cpp. Referenced by CSBMLExporter::createKineticLaw(), CODEExporter::exportReacParamsAndFuncs(), CModelParameter::getUnit(), CModel::printParameterOverview(), setScalingFactor(), and CMMLOutput::writeRHS(). Definition at line 959 of file CReaction.cpp. References CCopasiParameterGroup::beginIndex(), CCopasiParameterGroup::endIndex(), isLocalParameter(), mParameters, mpFluxReference, and mpParticleFluxReference. Referenced by CModel::appendDependentModelObjects(), CModel::removeReaction(), CQReactionDM::removeRows(), and ReactionsWidget1::slotBtnDelete(). Converts the function tree into the corresponding expression tree. All variable nodes are replaced by object nodes. Definition at line 1644 of file CReaction.cpp. Definition at line 192 of file CReaction.cpp. Referenced by CQReactionDM::data(), operator<<(), and ReactionsWidget1::setFramework(). Definition at line 198 of file CReaction.cpp. Referenced by CMathObject::compileParticleFlux(), CModel::convert2NonReversible(), and CMathReaction::initialize(). Definition at line 195 of file CReaction.cpp. Definition at line 252 of file CReaction.cpp. Referenced by CModelAdd::addReactions(), CSBMLExporter::checkForPiecewiseFunctions(), CModelAnalyzer::checkReaction(), CMathObject::compileFlux(), CModel::convert2NonReversible(), CSBMLExporter::createKineticLaw(), CMMLOutput::createParameterMapping(), CSBMLExporter::createReaction(), CQReactionDM::data(), SBMLImporter::doMapping(), CModelExpansion::duplicateReaction(), CCopasiXMLParser::KineticLawElement::end(), CODEExporter::exportKineticFunction(), CODEExporterC::exportKineticFunctionGroup(), CReactionInterface::getDeletedParameters(), getExpressionTree(), CModelParameter::getUnit(), CReactionInterface::initFromReaction(), CODEExporterC::KineticFunction2ODEmember(), stress_test::normalizeAndSimplifyExpressions(), CModel::printParameterOverview(), CCopasiXML::saveModel(), SBMLImporter::setCorrectUsage(), ReactionsWidget1::slotGotoFunction(), variable2object(), and CMMLOutput::writeRHS(). Gets the description of what parameters the function expects. Definition at line 576 of file CReaction.cpp. References fatalError, CFunctionParameterMap::getFunctionParameters(), mMap, and mpFunction. Referenced by addParameterMapping(), CModelAdd::addReactions(), CModelAnalyzer::checkReaction(), clearParameterMapping(), compile(), CFunctionAnalyzer::constructCallParametersActualValues(), CModel::convert2NonReversible(), CSBMLExporter::createKineticLaw(), CMMLOutput::createParameterMapping(), CModelExpansion::duplicateReaction(), CODEExporterC::KineticFunction2ODEmember(), CModelMerging::mergeMetabolites(), CModel::printParameterOverview(), CModelExpansion::replaceInReaction(), CCopasiXML::saveModel(), setParameterMapping(), and setParameterValue(). Definition at line 190 of file CReaction.cpp. Referenced by CLayoutInitializer::createReactionGlyph(), CModelExpansion::duplicateReaction(), CCopasiXMLParser::ReactionElement::end(), CODEExporter::exportKineticFunction(), CODEExporter::exportSingleFunction(), CQSelectionWizardPage::fillTree(), SBMLImporter::importMIRIAM(), CReactionInterface::initFromReaction(), CQReactionDM::insertRows(), CODEExporterBM::KineticFunction2ODEmember(), CODEExporterXPPAUT::KineticFunction2ODEmember(), ReactionsWidget1::loadFromReaction(), CCopasiXML::saveModel(), CQNewMainWindow::selectReaction(), CQReactionDM::setData(), CQReactionDM::setEquation(), CQSpeciesDetail::slotSwitchToReaction(), CCopasiXMLParser::ReactionGlyphElement::start(), CCopasiXMLParser::TextGlyphElement::start(), and CSBMLExporter::updateMIRIAMAnnotation(). Definition at line 876 of file CReaction.cpp. We are hiding local reaction parameter which are covered by global quantities. Definition at line 479 of file CReaction.cpp. 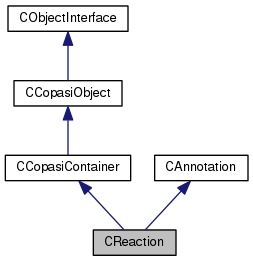 References CCopasiContainer::getObject(), CCopasiObject::getObjectName(), CCopasiObject::getObjectParent(), isLocalParameter(), CCopasiObject::isStaticString(), and mParameters. Definition at line 1688 of file CReaction.cpp. Definition at line 292 of file CReaction.cpp. Referenced by addParameterMapping(), clearParameterMapping(), SBMLImporter::findCorrespondingFunction(), getParameterMapping(), CModelParameter::getUnit(), initializeParameters(), isLocalParameter(), setParameterMapping(), setParameterMappingVector(), and setParameterValue(). Definition at line 432 of file CReaction.cpp. References C_INVALID_INDEX, fatalError, mMetabKeyMap, and mpFunction. Referenced by CModel::convert2NonReversible(), CSBMLExporter::createKineticLaw(), getParameterMapping(), CModelParameter::refreshFromModel(), and ParameterTable::updateTable(). 437 return mMetabKeyMap; //TODO this is kind of ugly! Definition at line 442 of file CReaction.cpp. Retrieve the mappings of kinetic function parameters. Definition at line 285 of file CReaction.h. Referenced by CModelAdd::addReactions(), CModelAnalyzer::checkReaction(), CFunctionAnalyzer::constructCallParametersActualValues(), CSBMLExporter::createKineticLaw(), CMMLOutput::createParameterMapping(), CModelExpansion::duplicateReaction(), CODEExporter::exportKineticFunction(), CODEExporterC::KineticFunction2ODEmember(), CReactionInterface::loadMappingAndValues(), CModelMerging::mergeMetabolites(), CModel::printParameterOverview(), CModelExpansion::replaceInReaction(), CCopasiXML::saveModel(), and variable2object(). Definition at line 288 of file CReaction.h. Definition at line 333 of file CReaction.cpp. Referenced by CModelAnalyzer::checkReaction(), CModel::convert2NonReversible(), SBMLImporter::createCReactionFromReaction(), CODEExporter::exportReacParamsAndFuncs(), CODEExporterC::exportTitleData(), CReactionInterface::getDeletedParameters(), CReactionInterface::loadMappingAndValues(), CQSimpleSelectionTree::populateTree(), CCopasiXML::saveModel(), CCopasiXMLParser::ConstantElement::start(), CCopasiXMLParser::ListOfConstantsElement::start(), test000058::test_bug1025_1(), test000058::test_bug1025_6(), test000059::test_unique_id_10(), test000059::test_unique_id_13(), test000059::test_unique_id_15(), test000059::test_unique_id_16(), test000059::test_unique_id_4(), test000059::test_unique_id_7(), and test000059::test_unique_id_9(). Definition at line 336 of file CReaction.cpp. Definition at line 326 of file CReaction.cpp. References fatalError, CCopasiParameterGroup::getValue(), mParameters, mpFunction, and CCopasiParameter::Value::pDOUBLE. Referenced by CModelAdd::addReactions(), CModel::convert2NonReversible(), CSBMLExporter::createKineticLaw(), CMMLOutput::createParameterMapping(), and CModelExpansion::duplicateReaction(). Definition at line 201 of file CReaction.cpp. Definition at line 207 of file CReaction.cpp. Referenced by CMathObject::compilePropensity(), CModel::convert2NonReversible(), CMathReaction::initialize(), and CHybridMethodODE45::setupMetab2React(). Definition at line 204 of file CReaction.cpp. Definition at line 210 of file CReaction.cpp. Definition at line 213 of file CReaction.cpp. Definition at line 1654 of file CReaction.cpp. Referenced by SBMLImporter::applyStoichiometricExpressions(), CSBMLExporter::collectIds(), CSBMLExporter::createReaction(), object2variable(), SBMLImporter::replaceObjectNames(), CCopasiXML::saveModel(), and CEvaluationNodeObject::toAST(). Initializes the mMetabNameMap vectors to the right size. Definition at line 558 of file CReaction.cpp. References fatalError, CFunctionParameterMap::getFunctionParameters(), mMap, mMetabKeyMap, mpFunction, CFunctionParameters::size(), and CFunctionParameter::VINT32. creates the mParamters List of CParameter objects. mMap needs to be initialized before. Definition at line 509 of file CReaction.cpp. References CCopasiParameterGroup::addParameter(), CCopasiParameterGroup::beginIndex(), C_FLOAT64, C_INVALID_INDEX, CCopasiParameter::DOUBLE, CCopasiParameterGroup::endIndex(), fatalError, CFunctionParameterMap::getFunctionParameters(), CCopasiParameter::getKey(), CFunctionParameters::getNumberOfParametersByUsage(), CCopasiObject::getObjectName(), CCopasiParameterGroup::getParameter(), CFunctionParameters::getParameterByUsage(), getParameterIndex(), mMap, mMetabKeyMap, mParameters, mpFunction, CFunctionParameter::PARAMETER, and CCopasiParameterGroup::removeParameter(). Definition at line 945 of file CReaction.cpp. References CCopasiContainer::addObjectReference(), calculate(), mFlux, mParticleFlux, mpFluxReference, mpParticleFluxReference, mpPropensityReference, mPropensity, CCopasiObject::setRefresh(), and CCopasiObject::ValueDbl. Definition at line 1712 of file CReaction.cpp. Referenced by ReactionsWidget1::loadFromReaction(), CCopasiXML::saveModel(), and ReactionsWidget1::saveToReaction(). Check whether the indexed parameter is a local parameter. Definition at line 449 of file CReaction.cpp. References CCopasiParameter::getKey(), CCopasiParameterGroup::getParameter(), mMetabKeyMap, mParameters, and CCopasiParameterGroup::size(). Referenced by CModelAdd::addReactions(), CFixLocalReactionParameters::changeModel(), CModel::convert2NonReversible(), CSBMLExporter::createKineticLaw(), CMMLOutput::createParameterMapping(), CModelExpansion::duplicateReaction(), CODEExporter::exportKineticFunction(), CODEExporter::exportReacParamsAndFuncs(), CODEExporterC::exportTitleData(), CQSimpleSelectionTree::filter(), getDeletedObjects(), CReactionInterface::getDeletedParameters(), getObject(), isLocalParameter(), CODEExporterC::KineticFunction2ODEmember(), CReactionInterface::loadMappingAndValues(), mustBeDeleted(), CQSimpleSelectionTree::populateTree(), CModel::printParameterOverview(), and CModelParameter::refreshFromModel(). Check whether the named parameter is a local parameter. Definition at line 462 of file CReaction.cpp. References C_INVALID_INDEX, fatalError, CFunctionParameter::FLOAT64, getParameterIndex(), isLocalParameter(), and mpFunction. Definition at line 229 of file CReaction.cpp. Referenced by CModelAdd::addReactions(), CModelAnalyzer::checkReaction(), CMathObject::compilePropensity(), SBMLImporter::createCReactionFromReaction(), CSBMLExporter::createReaction(), SBMLImporter::doMapping(), CModelExpansion::duplicateReaction(), SBMLImporter::findCorrespondingFunction(), CEFMTask::getReactionEquation(), CCopasiXML::saveModel(), CLLayoutRenderer::setDeduceSpeciesReferenceRoles(), and setFunctionFromExpressionTree(). Definition at line 148 of file CReaction.cpp. References C_INT32, CCopasiObject::getObjectAncestor(), CReadConfig::getVariable(), loadOld(), mChemEq, mpFunction, CReadConfig::SEARCH, CChemEqInterface::setChemEqFromString(), setFunction(), CCopasiObject::setObjectName(), and CChemEq::setReversibility(). Definition at line 767 of file CReaction.cpp. References C_FLOAT64, C_INT32, fatalError, CFunctionParameter::FLOAT64, CFunctionParameterMap::getFunctionParameters(), CFunctionParameters::getNumberOfParametersByUsage(), CCopasiObject::getObjectName(), CFunctionParameters::getParameterByUsage(), CFunctionParameter::getType(), CReadConfig::getVariable(), loadOneRole(), mMap, CFunctionParameter::MODIFIER, CFunctionParameter::PARAMETER, CFunctionParameter::PRODUCT, setParameterValue(), StringPrint(), and CFunctionParameter::SUBSTRATE. 792 // no. of parameters not matching function definition. 810 // could not find variable. 816 // unexpected parameter type. Definition at line 668 of file CReaction.cpp. References CChemEq::addMetabolite(), addParameterMapping(), C_INT32, clearParameterMapping(), fatalError, CModel::findMetabByName(), CFunctionParameterMap::getFunctionParameters(), CCopasiObject::getKey(), CModel::getMetabolites(), CFunctionParameters::getNumberOfParametersByUsage(), CCopasiObject::getObjectAncestor(), CCopasiObject::getObjectDataModel(), CCopasiObject::getObjectName(), CFunctionParameters::getParameterByUsage(), CFunctionParameter::getType(), CReadConfig::getVariable(), CFunctionParameters::isVector(), mChemEq, mMap, CChemEq::MODIFIER, CFunctionParameter::MODIFIER, CCopasiDataModel::pOldMetabolites, setParameterMapping(), StringPrint(), and CFunctionParameter::VINT32. 689 // not exactly one variable of this role as vector. 698 // could not find variable. 720 // no. of metabs not matching function definition. 735 // could not find variable. 741 // unexpected vector variable. 749 // information about modifiers. This has to be extracted from here. Definition at line 981 of file CReaction.cpp. Converts a single object node to a variable node. The usage term of the variable nodes is recorded in terms of CFunctionParameters that are stored in the replacementMap. On failure a NULL pointer is returned. Definition at line 1076 of file CReaction.cpp. References CEvaluationNodeVariable::ANY, CCopasiMessage::ERROR, escapeId(), CCopasiMessage::EXCEPTION, CFunctionParameter::FLOAT64, getChemEq(), CEvaluationNodeObject::getData(), CChemEq::getModifiers(), CCopasiObject::getObjectAncestor(), CCopasiObject::getObjectDataModel(), CCopasiObject::getObjectParent(), CChemEq::getProducts(), getSBMLId(), CChemEq::getSubstrates(), MCReaction, MCSBML, CFunctionParameter::MODIFIER, CCopasiDataModel::ObjectFromName(), CFunctionParameter::PARAMETER, CFunctionParameter::PRODUCT, CCopasiVector< T >::size(), CFunctionParameter::SUBSTRATE, CFunctionParameter::TIME, and CFunctionParameter::VOLUME. 1105 // We need to check that we have no reserved name. 1109 "PI", "EXPONENTIALE", "TRUE", "FALSE", "INFINITY", "NAN"
1198 // usage = "PARAMETER"
1211 // usage = "VOLUME"
1263 // usage = "TIME"
Replaces all object nodes in an expression tree by variable nodes. The usage term of the variable nodes is recorded in terms of CFunctionParameters that are stored in the replacementMap. On failure a NULL pointer is returned. Definition at line 1285 of file CReaction.cpp. References CNodeContextIterator< Node, Context >::context(), CEvaluationNode::copyNode(), CNodeContextIterator< Node, Context >::end(), CCopasiMessage::ERROR, fatalError, CEvaluationNode::getType(), CEvaluationNode::INVALID, MCReaction, CEvaluationNode::MV_FUNCTION, CNodeContextIterator< Node, Context >::next(), CEvaluationNode::OBJECT, object2variable(), CNodeContextIterator< Node, Context >::parentContextPtr(), pResult, CEvaluationNode::STRUCTURE, CEvaluationNode::type(), and CEvaluationNode::VARIABLE. Definition at line 1700 of file CReaction.cpp. Definition at line 1703 of file CReaction.cpp. Referenced by ReactionsWidget1::saveToReaction(), and CCopasiXMLParser::ReactionElement::start(). Definition at line 255 of file CReaction.cpp. References CCopasiMessage::ERROR, CFunctionDB::findLoadFunction(), CCopasiRootContainer::getFunctionList(), and MCReaction. Referenced by CModelAdd::addReactions(), CModel::convert2NonReversible(), CReaction(), SBMLImporter::createCReactionFromReaction(), CModelExpansion::createDiffusionReaction(), CModelExpansion::duplicateReaction(), CCopasiXMLParser::KineticLawElement::end(), load(), setFunctionFromExpressionTree(), test000058::test_bug1025_1(), test000058::test_bug1025_6(), test000059::test_unique_id_10(), test000059::test_unique_id_13(), test000059::test_unique_id_15(), test000059::test_unique_id_16(), test000059::test_unique_id_4(), test000059::test_unique_id_7(), test000059::test_unique_id_9(), and CReactionInterface::writeBackToReaction(). Definition at line 266 of file CReaction.cpp. References CCopasiObject::addDirectDependency(), CCopasiRootContainer::getUndefinedFunction(), CFunction::getVariables(), CFunctionParameterMap::initializeFromFunctionParameters(), initializeMetaboliteKeyMap(), initializeParameters(), mMap, mpFunction, and CCopasiObject::removeDirectDependency(). Converts an expression tree into a CFunction object and sets the mapping for the reaction. Definition at line 1343 of file CReaction.cpp. References CFunctionDB::add(), CCopasiObject::addDirectDependency(), CFunction::addVariable(), SBMLImporter::areEqualFunctions(), CEvaluationTree::compile(), CEvaluationNode::copyBranch(), CFunctionDB::findFunction(), CCopasiObject::getObjectName(), CEvaluationTree::getRoot(), CFunctionParameter::getType(), CFunctionParameter::getUsage(), CFunction::getVariables(), CFunction::isReversible(), isReversible(), mpFunction, objects2variables(), pdelete, CCopasiObject::removeDirectDependency(), setFunction(), CCopasiObject::setObjectName(), setParameterMapping(), CFunction::setReversible(), CEvaluationTree::setRoot(), TriFalse, and TriTrue. 1345 // walk the tree and replace all object nodes with variable nodes. Definition at line 141 of file CReaction.cpp. Sets a parameter mapping for the indexed parameter. Definition at line 339 of file CReaction.cpp. References fatalError, CFunctionParameter::FLOAT64, getFunctionParameters(), mMetabKeyMap, and mpFunction. Referenced by CModelAdd::addReactions(), CFixLocalReactionParameters::changeModel(), CModel::convert2NonReversible(), CModelExpansion::createDiffusionReaction(), SBMLImporter::doMapping(), CModelExpansion::duplicateReaction(), loadOneRole(), setFunctionFromExpressionTree(), CModelParameter::updateModel(), and CReactionInterface::writeBackToReaction(). Sets a parameter mapping for the named parameter. Definition at line 357 of file CReaction.cpp. References C_INVALID_INDEX, fatalError, CFunctionParameter::FLOAT64, getParameterIndex(), mMetabKeyMap, and mpFunction. Definition at line 390 of file CReaction.cpp. Referenced by CModel::convert2NonReversible(), and CCopasiXMLParser::KineticLawElement::end(). Definition at line 303 of file CReaction.cpp. References C_INVALID_INDEX, fatalError, CFunctionParameter::FLOAT64, getFunctionParameters(), CCopasiParameter::getKey(), CCopasiParameterGroup::getParameter(), getParameterIndex(), mMetabKeyMap, mParameters, mpFunction, and CCopasiParameterGroup::setValue(). Referenced by CModelAdd::addReactions(), CModel::convert2NonReversible(), CModelExpansion::duplicateReaction(), loadOld(), test000058::test_bug1025_1(), test000058::test_bug1025_6(), test000059::test_unique_id_10(), test000059::test_unique_id_13(), test000059::test_unique_id_15(), test000059::test_unique_id_16(), test000059::test_unique_id_4(), test000059::test_unique_id_7(), test000059::test_unique_id_9(), and CReactionInterface::writeBackToReaction(). Definition at line 247 of file CReaction.cpp. Referenced by CModelAdd::addReactions(), CModel::convert2NonReversible(), SBMLImporter::createCReactionFromReaction(), CModelExpansion::createDiffusionReaction(), CModelExpansion::duplicateReaction(), and CCopasiXMLParser::ReactionElement::start(). Definition at line 1649 of file CReaction.cpp. Referenced by SBMLImporter::createCReactionFromReaction(), CSBMLExporter::createReaction(), CCopasiXMLParser::ReactionElement::start(), and CCopasiXMLParser::SBMLMapElement::start(). Definition at line 879 of file CReaction.cpp. References C_FLOAT64, CCopasiMessage::ERROR, CMetab::getCompartment(), getCompartmentNumber(), CCopasiObject::getDirectDependencies(), CCopasiException::getMessage(), CCopasiMessage::getNumber(), CCopasiObject::getObjectAncestor(), CCopasiObject::getObjectName(), CChemEq::getProducts(), CModel::getQuantity2NumberFactor(), CChemEq::getSubstrates(), CModelEntity::getValuePointer(), CModelEntity::getValueReference(), MCChemEq, mChemEq, MCReaction, mDefaultScalingFactor, mpFluxReference, mpParticleFluxReference, mScalingFactor, mUnitScalingFactor, CCopasiObject::setDirectDependencies(), and CCopasiVector< T >::size(). Converts a single variable node to an object node. On failure a NULL pointer is returned. Definition at line 1614 of file CReaction.cpp. References C_INVALID_INDEX, CEvaluationNodeObject::CN, CCopasiMessage::EXCEPTION, CFunctionParameters::findParameterByName(), CKeyFactory::get(), CCopasiObject::getCN(), CCopasiNode< _Data >::getData(), getFunction(), CCopasiRootContainer::getKeyFactory(), getParameterMappings(), CFunction::getVariables(), MCReaction, CFunctionParameter::VFLOAT64, and CFunctionParameter::VINT32. Replaces all variable nodes in a function tree by object nodes. On failure a NULL pointer is returned. Definition at line 1440 of file CReaction.cpp. References CCopasiNode< _Data >::addChild(), CEvaluationNode::CALL, CEvaluationNode::CHOICE, CEvaluationNode::CONSTANT, CCopasiMessage::ERROR, CEvaluationNode::FUNCTION, CCopasiNode< _Data >::getChild(), CCopasiNode< _Data >::getData(), CCopasiNode< _Data >::getSibling(), CEvaluationNode::getType(), CEvaluationNode::INVALID, CEvaluationNode::LOGICAL, MCReaction, CEvaluationNode::MV_FUNCTION, CEvaluationNode::NUMBER, CEvaluationNode::OBJECT, CEvaluationNode::OPERATOR, CEvaluationNode::STRUCTURE, CEvaluationNode::subType(), CEvaluationNode::type(), CEvaluationNode::VARIABLE, variable2object(), and CEvaluationNode::WHITESPACE. Definition at line 558 of file CReaction.h. Referenced by addModifier(), addProduct(), addSubstrate(), compile(), getChemEq(), getCompartmentNumber(), getLargestCompartment(), isReversible(), load(), loadOneRole(), operator<<(), setReversible(), and setScalingFactor(). The default scaling factor of a reaction which is 1. Definition at line 553 of file CReaction.h. This flag indicates whether the reaction is treated as fast. The interpretation of fast is up to to the integration algorithm. Definition at line 623 of file CReaction.h. Referenced by isFast(), and setFast(). Definition at line 568 of file CReaction.h. Referenced by calculate(), calculateFlux(), compile(), getFlux(), initObjects(), and operator<<(). This describes the mapping of the species and parameters to the function parameters. Here are the pointers to the actual objects and values. Definition at line 599 of file CReaction.h. Referenced by calculate(), calculatePartialDerivative(), compile(), getCallParameters(), getFunctionParameters(), getParameterIndex(), initializeMetaboliteKeyMap(), initializeParameters(), loadOld(), loadOneRole(), and setFunction(). This describes the mapping of the species to the function parameters. Here the keys of the metabolites (as in the chemical equation) are stored. Definition at line 605 of file CReaction.h. Referenced by addParameterMapping(), clearParameterMapping(), compile(), getParameterMapping(), getParameterMappings(), initializeMetaboliteKeyMap(), initializeParameters(), isLocalParameter(), operator<<(), setParameterMapping(), setParameterMappingVector(), and setParameterValue(). This is a list of parameter objects. Definition at line 610 of file CReaction.h. Referenced by getDeletedObjects(), getObject(), getParameters(), getParameterValue(), initializeParameters(), isLocalParameter(), mustBeDeleted(), operator<<(), and setParameterValue(). Definition at line 574 of file CReaction.h. Referenced by calculate(), calculateParticleFlux(), compile(), getParticleFlux(), and initObjects(). Definition at line 569 of file CReaction.h. Referenced by compile(), getDeletedObjects(), getFluxReference(), initObjects(), mustBeDeleted(), and setScalingFactor(). Definition at line 563 of file CReaction.h. Referenced by addParameterMapping(), calculate(), calculatePartialDerivative(), calculateParticleFlux(), clearParameterMapping(), compile(), CReaction(), getFunction(), getFunctionParameters(), getParameterMapping(), getParameterValue(), initializeMetaboliteKeyMap(), initializeParameters(), isLocalParameter(), load(), operator<<(), setFunction(), setFunctionFromExpressionTree(), setParameterMapping(), setParameterMappingVector(), and setParameterValue(). Definition at line 575 of file CReaction.h. Referenced by compile(), getDeletedObjects(), getParticleFluxReference(), initObjects(), mustBeDeleted(), and setScalingFactor(). Definition at line 581 of file CReaction.h. Referenced by getPropensityReference(), and initObjects(). Definition at line 580 of file CReaction.h. The id of the corresponding reaction in an SBML file. This value is either set upon importing an SBML file, or when the object is first exported to an SBML file. Definition at line 617 of file CReaction.h. Definition at line 588 of file CReaction.h. Referenced by calculate(), calculatePartialDerivative(), operator<<(), and setScalingFactor(). Definition at line 593 of file CReaction.h. Referenced by calculate(), operator<<(), and setScalingFactor().